Or a Wikidata entity identifier. The formatting is actually mostly done with a CSL template (though it needs a hack to get it to output HTML), though adapted to also output the DOI hyperlink and Altmetric icon (you can find the customized CSL in the HTML source code as CC-BY-SA 3.0). The citation.js library fetches the data from Wikidata and actually has to deal with the structure there, which includes a mixture of 'author' and 'author name string' fields for author information. Well done! If you like this, make sure to check out Wikicite, OpenCitations, and Scholia, projects that enabled and triggered some of the ideas behind the above citation.js use! Fourth example is harder then the third and I hope I got the translation of Julia Reda's example in good way. The starting point is simple enough, bookmarking things where an image is used. However, I am less sure to what extend we use this in online science. Well, you can see how much trouble I had with finding a good equivalent here. So, what is a science shopping list? 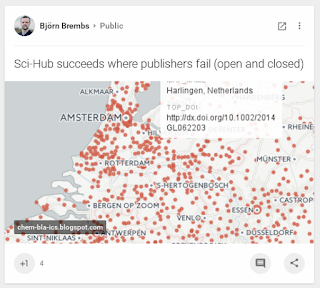 The above example shows a Google+ post by Björn Brembs. Now, G+ is not really a shopping list, but then again, literature is what researchers buy. Literally. We pay millions and millions for it. Second, we do have dedicated shopping lists for these products, but they not always support images. Of course, these shopping lists are our CiteULike, Mendeley, ResearchGate, etc accounts. Second limitation of this example is that we would not consider most of our literature of journalistic nature. Therefore the above example. Blogs are typically a mixture of science writing and a kind of journalism. It's a grey area. Now, under the new laws, Björn would have to ask my permission, and worse, G+ needs to install a monitoring system to see if Björn got a proper license as to not break my copyright. So, back to the likes of ResearchGate and ScienceOpen. With the current proposal, any system of this kind with some commercial model in mind (both are set up by SMEs), they will have to install this monitoring system (after all, we also happily bookmark Nature News articles). The cost of that investment will have to come from somewhere, so this has an enormous impact on their sustainability. Even worse, the wordings in the proposal I have seen so far, and to the extend I understand Julia's worries, there are no limitations set on this; few or no words on allowed behavior. So, what about dissemination systems in general? I think later examples (we still have six to go! ), will shed more light on that. After Antony Williams left the ChemSpider team, he moved on to the EPA. Since then, he has set up the EPA CompTox Dashboard (see also doi:10.1007/s00216-016-0139-z [€]). And in August he was kind enough to upload mappings between InChIKeys (doi:10.1186/s13321-015-0068-4) and their identifiers on Figshare (doi:10.6084/m9.figshare.3578313.v1) as a tab-separated values (TSV) file. Because this database is of interest to our pathway and systems biology work, I realized I wanted ID-ID mappings in our BridgeDb identifier mappings files (doi:10.1186/1471-2105-11-5). As I wrote earlier, I have adopted Wikidata (doi:10.3897/rio.1.e7573) as data source. So, entering these new identifiers in Wikidata is helpful. 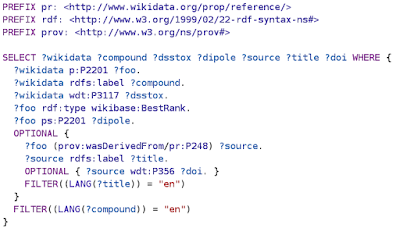 Somewhere in the past few months I proposed the needed Wikidata property, P3117 ("DSSTOX substance identifier"), which was approved some time later. For entering the mappings, I have opted to write a Bioclipse script (doi:10.1186/1471-2105-10-397) that uses the Wikidata SPARQL endpoint to get about 150 thousand Wikidata item identifiers (Q-codes) and their InChIKeys. I then parses over the lines in the TSV file from Figshare and creates input for Wikidata for each match, based on exact InChIKey string equivalence. 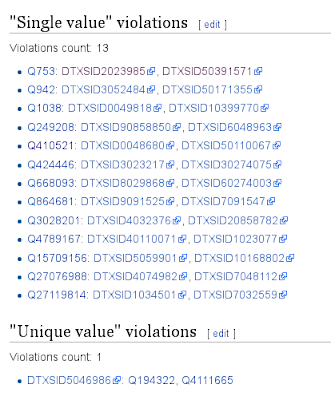 I entered about 36 thousand of such statements to Wikidata. Thus, the yield is about 5%, calculating from the CompTox Dashboard as starting point with about 720 thousand identifiers. From a Wikidata perspective, the yield is higher. There are about 150 thousand items with an InChIKey, so that 24% could be mapped. Based on properties of the property, it does some automatic validation. 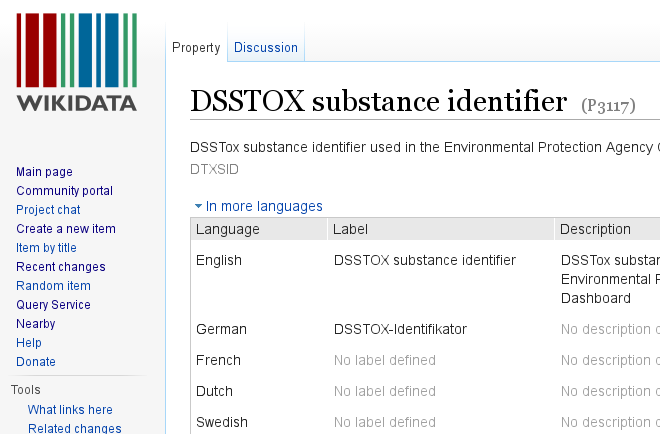 For example, it is specified that any Wikidata item can only have one DSSTOX substance identifier, because it can only have one InChIKey too. 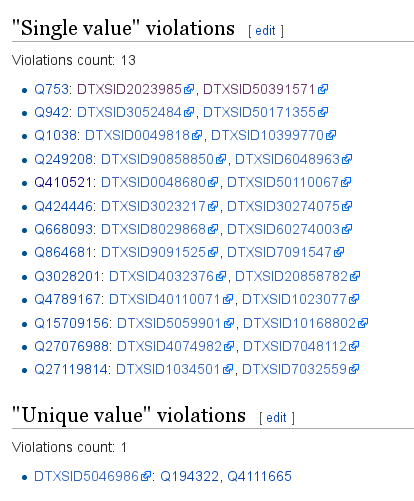 Similarly, there can not be two Wikidata items with the same DSSTOX identifier. Normally, because because of how Wikidata works, there can be isolated examples. With less then 25 constraint violations, the quality of the process turned out pretty high (>99.9%). Some of the issues have been manually inspected. Causes vary. One issue was that the Wikidata item in fact had more than one InChIKey. A possible reason for that is that it does not distinguish between various forms of a compound. Two Wikidata items have been split up accordingly. Other problems are due to features of the CompTox Dashboard, and some issues have been tweeted to the Dashboard team. Importantly, this query shows the source where this data comes from, one of the advantages of Wikidata.